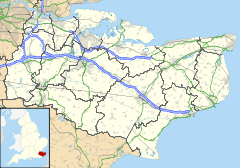 Burham is a village and civil parish in the Tonbridge and Malling district of Kent, England. According to the 2001 census it had a population of 1,251, decreasing to 1,195 at the 2011 Census. The village is near the Medway towns. The history of Burham can be traced to Roman times. AD43 saw the Battle of the Medway at the crossing point on the River Medway, where Burham is now, when the invading Roman legions, advancing west across Kent, were confronted by a massed army of the ancient British tribes. The Roman victory altered the course of history in Britain, and the remains of Roman buildings have been found in Burham and the neighbouring village of Eccles. There has been a Settlement in Burham since Saxon times, "ham" being the Saxon word for "settlement" — the "Bur" part of the name comes from "burgh", or borough, referring to the borough of Rochester. The name "Burham" means "the village near the borough". In the 11th century Burham belonged to Leofwine Godwinson, brother of King Harold. He was killed along with his brother at the Battle of Hastings in 1066. It is listed as having six sulings (about 240 acres) of land. There were two major farms, 15 "villeins" each farming 30 acres (120,000 m2) and 20 "borderers" each farming about 5 acres (20,000 m2). There was a church and a mill with woodland sufficient to support 20 hogs. The medieval church of St Mary is now redundant and stands on the riverbank. It is now cared for by the Churches Conservation Trust having been saved from dereliction by the Friends of Friendless Churches in the 1950s. About 1830 Burham became a "cement village" on the Medway, after the discovery of the manufacturing technique for Portland cement (so called because of its resemblance to Portland stone). By 1841 the village's population had grown to 380 and increased to a maximum of 1,725 in 1901. Today it is about 1,300. In July 1998, the Kent Air Ambulance helicopter, returning from an emergency call in Rochester, crashed in woodland near Burham, after hitting power lines. All three crew — the pilot and two paramedics — were killed. ^ a b "Civil Parish population 2011". Neighbourhood Statistics. Office for National Statistics. Retrieved 23 September 2016. ^ Ordnance Survey: Landranger map sheet 188 Maidstone & Royal Tunbridge Wells (Sevenoaks & Tonbridge) (Map). Ordnance Survey. 2014. ISBN 9780319228814. Wikimedia Commons has media related to Burham, Kent. This page was last edited on 15 December 2018, at 12:19 (UTC).